Indian analysts, however, remain divided on the sincerity and reasons for Islamabad’s sudden flip-flop. On December 11, Pakistan’s Foreign Minister Shah Mehmood Qureshi surprised international observers by acknowledging India’s stake in Afghanistan and asking New Delhi to help end the war in Afghanistan. To justify his calls for India-Pakistan cooperation in Afghanistan, Qureshi emphasized the “shared responsibility” of all regional powers to end the conflict and urged India to follow the “solution through dialogue” approach advocated by the United States, Pakistan, and the Taliban. Despite Pakistan’s change in rhetoric toward Indian involvement in Afghanistan, India’s reaction to Qureshi’s statement was predictably skeptical. Mumbai-based newspaper The Economic Times acknowledged the symbolic significance of Qureshi’s statement but also claimed that Islamabad would react negatively to expanded Indian involvement in Afghanistan, due to its long-standing fear of strategic encirclement. Indian Foreign Minister Sushma Swaraj refrained from commenting on Qureshi’s statement, while her description of Qureshi’s “googly remarks” on Sikh rights continued to circulate widely across Indian social media outlets. In spite of this official attitude of nonchalance and dismissals of Qureshi’s comments in major media outlets, my discussions with members of the Indian expert community revealed varying explanations for Pakistan’s qualified endorsement of an expanded Indian role in Afghanistan. The primary points of contention relate to Pakistan’s willingness to change its Afghanistan strategy and whether Qureshi’s comments are representative of the Pakistani military’s opinions. Retired Major General Harsha Kakar, who served in the Indian military from 1979-2015, emphasized the symbolic significance of Qureshi’s statement and its linkage to rhetoric emanating from the Pakistani military’s headquarters in Rawalpindi. In a comment to The Diplomat, Kakar argued that Qureshi’s comments are a direct consequence of Pakistan’s economic malaise and the unsustainability of its aspirations for military parity with India. According to Kakar, the recent comments from Major General Asif Ghafoor, the director general of the Pakistani military’s Inter-Services Public Relations wing, about Pakistan’s need to maintain peace on its borders reflect this geopolitical reality. Rajesh Rajagopalan, a professor of international politics at New Delhi’s Jawaharlal Nehru University, presented another explanation for Qureshi’s comments, which aligns more closely with the skeptical view outlined by The Economic Times. In a comment to The Diplomat, he argued that Qureshi’s “surprising” statement did not reflect a major shift in Pakistani foreign policy and represented Pakistan’s usual tendency of “saying the right things” on Afghanistan. Rajagopalan also argued that there is a very real possibility that the Pakistani military, which directs Islamabad’s strategy toward Afghanistan, did not endorse Qureshi’s statement. Although Indian geopolitical analysts disagree on the intentions behind Qureshi’s statement, there appears to be a near-unanimous consensus around India’s need to uphold its current strategic inflexibility policy toward Pakistan. If Pakistan is insecure about its own capabilities, as Kakar suggests, and is reaching out to India over Afghanistan as a last-ditch olive branch, India’s optimal reaction is to resist Islamabad’s overtures and force further compromises. In particular, India views Qureshi’s outreach as a golden opportunity to pressure Pakistan to extradite Lakshar e-Taiba (LeT) terrorists living on its soil, as this group perpetrated the November 2008 Mumbai attacks. Recent developments suggest that India’s pressure strategy has helped breach the legal stalemate over the Mumbai attacks. On December 7, Pakistan’s Prime Minister Imran Khan admitted that Islamabad should resolve the case as part of its broader counterterrorism campaign. Khan’s statement was a response to Indian Ministry of External Affairs spokesman Raveesh Kumar’s accusations that Pakistan was “insincere” about bringing the Mumbai perpetrators to justice. For now, Pakistan appears willing to continue its strategy of plausible deniability about the whereabouts of prime LeT suspects, like the organization’s founder Hafiz Saeed and his close ally Hafiz Abdul Rahman Makki. However, India hopes that linking LeT extraditions to cooperation on Afghanistan will force Pakistan to take this investigation more seriously. A similar logic holds if Qureshi’s statement is merely a way for Pakistan to improve its international image, without changing its policies. In this scenario, India would be very reluctant to cooperate with Pakistan on Afghanistan as it does not want to look like Islamabad is leading the conflict resolution process. This concern is especially acute, as Qureshi has claimed that Pakistan successfully pressured a previously reluctant Indian Prime Minister Narendra Modi to open the Kartarpur corridor. India would not want Pakistan to claim a similar public relations victory on Afghanistan, unless Islamabad fundamentally changes its relationships with the Taliban and the Haqqani Network. The proximity between Qureshi’s comments and the 2019 Indian general elections will likely tempt Modi to continue New Delhi’s strategic inflexibility policy toward Pakistan, even if Qureshi is sincere about expanded cooperation with India on Afghanistan. Retired Brigadier General Venkataraman Mahalingam, a prominent New Delhi-based defense analyst, told The Diplomat that Indian policymakers remain united around the belief that terror and talks cannot go together. As the linkage between Pakistan and transnational terrorism is etched into the Indian popular consciousness, a radical change in India’s strategy towards Pakistan will be accompanied by significant popular backlash. This outlook, combined with Indian concerns about Pakistani violations of the 2003 ceasefire agreement, explained Swaraj’s decision to rebuff Qureshi’s outreach at the UN General Assembly in September. Adopting a more amenable position on cooperation with Pakistan, in the absence of major concessions from Islamabad, would also detract from the BJP’s efforts to frame Congress Party leader Rahul Gandhi as soft on Pakistan. If the Modi-led BJP records a decisive victory over the Congress Party in 2019, the possibility of small-scale India-Pakistan cooperation on Afghanistan will marginally increase. As anti-Pakistan sentiments continue to surge in India, Modi is unlikely to frame dialogue with Pakistan on Afghanistan as part of a rapprochement with Islamabad but will instead extol New Delhi’s commitment to collective security preservation in the Indo-Pacific region. Over the past year, Modi has highlighted New Delhi’s interest in Indo-Pacific collective security initiatives, through under-the-radar diplomatic engagement with North Korea and diplomatic efforts to convince Myanmar to quell the Rohingya crisis. Helping to stabilize Afghanistan would allow India to bolster its prestige within the Shanghai Cooperation Organization (SCO), even if it is accompanied by the undesirable necessity of cooperating with Pakistan. While Qureshi’s support for an expanded Indian role in Afghanistan constitutes a marked shift from Pakistan’s long-standing policies, Indian analysts remain divided on the sincerity of Qureshi’s rhetoric and the reasons for Islamabad’s sudden flip-flop on India’s role in Afghanistan. 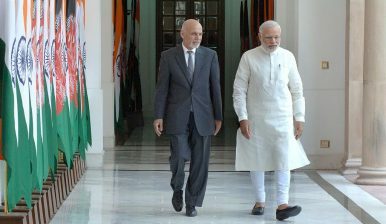 These uncertainties and electoral pressures will likely stymie short-term India-Pakistan cooperation on Afghanistan, but the door remains open to limited dialogue on Afghanistan in the second half of 2019. Samuel Ramani is a DPhil candidate in International Relations at St. Antony’s College, University of Oxford. He is also a contributor to the Washington Post and The National Interest. He can be followed on [email protected]. On Tuesday, Afghan President Ghani visited India. On Wednesday, U.S. Secretary of State Tillerson is to do the same.